Exhibit #1: On March 11, the world learned that Nasrin Sotoudeh, a human rights lawyer in Iran, had been sentenced to 33 years in prison and 148 lashes. Her crime? Defending in court women who challenged Iran’s compulsory and degrading hijab (veiling) laws. Her conviction and sentence consolidate Iran’s reputation as a cruel oppressor of women’s rights. 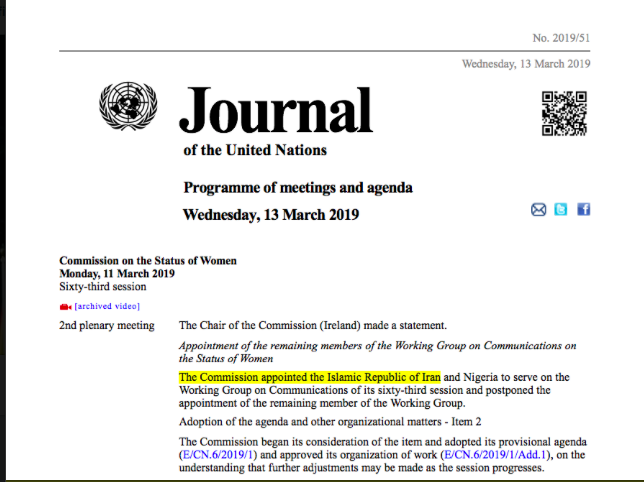 Exhibit #2: Two days later, on March 13, the United Nations appointed Iran to a Status of Women committee that investigates human rights complaints. CONCLUSION: The United Nations produces an endless stream of pretty words about equality and justice. It holds interminable meetings. It issues a non-stop river of reports and declarations about how it’s making the world a better place. But in the end, it’s all just words. Empty. Insincere. Meaningless. Actions are what matter. Rather than distancing itself from Iran, rather than protesting those unequal laws and that barbaric legal system, the United Nations chose to ignore Iran’s coercive, institutionalized sexism. A country with a “reputation as a cruel oppressor of women’s rights” will now investigate precisely these kinds of violations. A country in which a lawyer will suffer 148 lashes for doing her job, will sit in judgment upon others. Again and again, through its deeds, the UN reveals its moral bankruptcy. Any country or region that seeks paradise via the purported moral leadership of the UN, will be grimly disappointed. Theirs will be a world in which medieval punishments and egregiously long prison sentences raise few eyebrows. This entry was posted on March 25, 2019 by Donna Laframboise in ethical & philosophical, free speech and tagged Amnesty International, Iran, women.